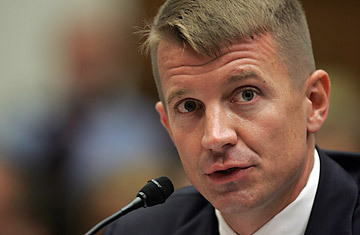 Though the reclusive Erik Prince stepped down as CEO of the private-security company Blackwater (recently renamed Xe) in March, some explosive new headlines have put him back in the spotlight. According to a report in The Nation, an ex-Blackwater employee has alleged in federal testimony that Prince may have been involved in the murder of unnamed individuals assisting a federal investigation into Blackwater's actions in Iraq and Afghanistan. The individual also claims Blackwater's culture encouraged killings in Iraq as part of a larger "crusade" against Muslims. The affidavit, one of two submitted Aug 3. to a Virginia federal court, is anonymous. The individuals say they fear retribution from Prince. No charges have been filed in connection with the allegations, and Xe issued a statement saying it would respond to the "anonymous unsubstantiated and offensive assertions" in an Aug. 17 brief. Prince has not commented on the accusations.  Born June 6, 1969 in Holland, Mich.
 Son of Edgar Prince, a wealthy and influential Michigan Republican who helped found the Family Research Council in the late 1980s.  Has six children. His first wife, Joan, died in 2003, and Prince has since remarried.  Began attending the Naval Academy but transferred to Hillsdale College in Michigan, from which he graduated in 1992.  Served as an intern for George H.W. Bush in 1990.  Joined the Navy Seals in 1992. Left in 1996 after his father's death.  Gained a windfall after his mother sold his father's company, Prince Corp., for $1.3 billion in 1996.  Founded the private-security firm Blackwater USA in 1997 and purchased land in North Carolina to house the company and its training facilities.  Formed Blackwater Security Consulting in 2002, when he obtained government contracts to protect U.S. personnel in Iraq and Afghanistan.  Testified before Congress in 2007 to defend Blackwater against allegations of misconduct by its operatives in Iraq and Afghanistan.  Resigned as CEO of Xe in March 2009, after Iraq barred Blackwater from operating in the country. Retained his title as chairman, although he claims to have little involvement in the day-to-day operations of the company. "Blackwater, in a lot of ways, reflects Prince's own personality: stubborn, driven, and obsessed with finding ways to make things happen."  Suzanne Simons, in her 2009 book, Master of War, detailing Prince's time at the helm of Blackwater. "Based on information provided to me by former colleagues, it appears that Mr. Prince and his employees murdered, or had murdered, one or more persons who have provided information, or who were planning to provide information, to the federal authorities about the ongoing criminal conduct."  Testimony of John Doe #2, entered into federal court in Virginia on Aug. 3. "Mr. Prince intentionally deployed to Iraq certain men who shared his vision of Christian supremacy, knowing and wanting these men to take every available opportunity to murder Iraqis. Many of these men used call signs based on the Knights of the Templar, the warriors who fought the Crusades." "It is obvious that Plaintiffs have chosen to slander Mr. Prince rather than raise legal arguments or actual facts that will be considered by a court of law."  Statement released by Xe on Aug. 6 in response to the allegations. On the dangers of operating in Iraq: "Obviously, you can see the business risk that goes with it  being sued, being maligned in the press, a very significant rush to judgment. It can jeopardize all the rest of the work that we've done in the rest of the world without any controversy."  October 2007, in congressional testimony. On being unable to give information to Congress about Blackwater's profits: "I am not a financially-driven guy,"
On any connection between Blackwater and Christianity: "I'm a practicing Roman Catholic, but you don't have to be Catholic, you don't have to be a Christian to work for Blackwater." Read "Iraqis Welcome Blackwater Indictments."